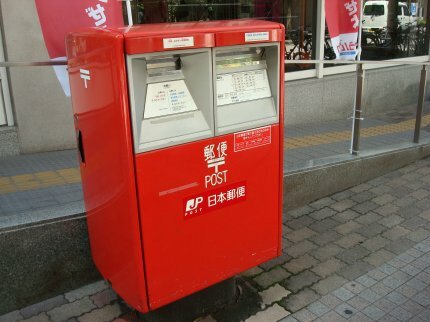 If you are in Japan on holiday you may well want to send a letter or postcard back home. Here are some simple tips to help you out if you aren’t sure how to do it. Address your letter as you normally would in the language of the country you are sending it to. I’d suggest writing the country name in block capitals as joined up hand writing isn’t usually taught in Japanese schools. Next to the country name write the country name (again) but this time in Japanese. The best list of Japanese country names I’ve found so far is the list at foreignwords.com. The countries are listed by ISO codes, and although you may not be an ISO code expert, I’m betting you’ll recognise the code for your own country. Some of them are much easier to write than others! So don’t worry if you can’t write the Japanese version, as long as you have the country name in block capitals they will probably work out where to send it at the post office. You should find post offices in most towns and cities. Look for the symbol that looks like a ‘T’ with an extra line on the top. About.com have got a post office lesson on their website. You can easily get the job done using much less Japanese then they are teaching you. But it is worth looking at their lesson, because it has audio files for some of the words you might need. Then hand them you letter or card. You’d usually hand it to them using two hands, and with the address rotated correctly so they can read it. If they haven’t quite got what you said you could point to the country name and they should know what you want. They’ll then weigh the letter and tell you the price. The price should also be on the till so you can just read the price if you don’t understand Japanese numbers. Pay them the money and get your change. Like in most shops and restaurants you don’t hand the staff member the money directly. You would put it in a tray, or on the counter for them to pick up. They will however usually give you the change back into your hand with the receipt. Then they will get the stamps and the airmail sticker and put them onto the envelope. If there is a choice of different stamps they might ask you to choose one. You could just point at which one you want. To finish off they’ll either take the letter away and say “ari-ga-tou gozai-mashita”, or hand it to you for you to post yourself. You can thank them by saying “ari-ga-tou gozai-mass” (ありがとうございます) if you want to be extra polite. This entry was posted on Thursday, June 17th, 2010 at 3:53 am and is filed under Japan. You can follow any responses to this entry through the RSS 2.0 feed. You can leave a response, or trackback from your own site.